If you're trying a new hair style, it's essential to know the differences in hair terminology when you show up at the beauty salon so you don't run into a fashion disaster. For those with longer hair, both angled and layered hairstyles can look incredible. 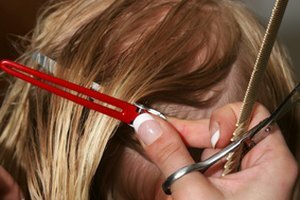 You need to know the differences in how the hair will be cut and how it will lay, however, before you tell your hair stylist what to do and she starts cutting away your precious locks. The easiest way to differentiate an angled hairstyle from a layered one is by looking at the bottom length of the hair. In an angled hairstyle, one side of the head, usually the back but sometimes the right or left, has shorter hair than the bottom lengths of the other sides. One of the most common angled haircuts is having short hair in the back and longer hair on either side of the head. Typically, the bottom length of a layered hairstyle is the same length all the way around the head. One of the main differences between an angled hairstyle and a layered one is the length of hair that works with either hairstyle. Typically, girls who prefer long hair select a layered hairstyle over an angled one. To properly accentuate an angled hairstyle, usually the short side is no longer than chin length. On the other hand, a layered hairstyle can have any length, from above the shoulder to waist length. When it comes to styling angled and layered hairstyles, layered hair gives you more options than an angled cut. To properly show off the cut, an angled hairstyle should be straightened or naturally straight. However, layers can show up or blend in well with straight, wavy or curly hair. Angled and layered hair also have differences in the appearance they give to the body of hair. Layered hair typically increases the body of hair, while an angled hairstyle tends to decrease the look of body in your hair. 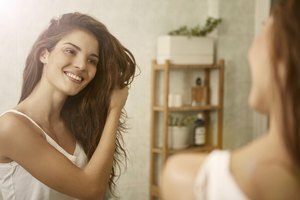 The amount of body your hair already has and what you want to make it look like could have an impact on your decision to get an angled or a layered hairstyle.